USS Tennesee (BB-43) bombarding Okinawa with her 14-inch main battery as LVT-4 Amtracs pass on their way to Hagushi Beach. US Navy Admiral Richmond Kelly Turner gave the order to "Land the Landing Force" at 0406 Hours, April 1, 1945 - both Easter Sunday and April Fool's Day. The pre-invasion bombardment started at 0530 and as the sun rose at 0621 the soldiers and marines who would shortly be landing on it, saw Okinawa Gunto for the first time. Gradually, the amtracs formed into groups and started to circle, awaiting the order to head towards the beach. Carrier planes and gunboats bombarded the beaches and as the control craft pennants came down, an eight-mile line of amtracs began their 4,000 yard dash to the beach. The assault force churned their way past Tennessee and formed into the regimental assault waves of two battalions abreast in eight waves: Wave 1 - twenty-eight LVT(A)-4 amtracs with 75mm howitzers; Wave 2 - sixteen LVT-4 amtracs with assault troops; Wave 3 to 6 - twelve LVT-4s with assault troops and crew-served weapons; Wave 7 - varied numbers of LSMs or LCMs with floatation-equipped Sherman tanks; Wave 8 - LVT-4s with support troops. There was only sporadic mortar and shellfire as the assault troops landed - resistance from the 1st Specially Established Regiment was light as it had only rudimentary training and few heavy weapons. Okinawa was not to be a repeat of Peleliu, Tarawa or Iwo Jima with the assault waves meeting fierce and coordinated resistance upon landing. Some 50,000 American troops landed in the first hour and the larger landing ships started to deliver heavy weapons and armoured vehicles at 1400. 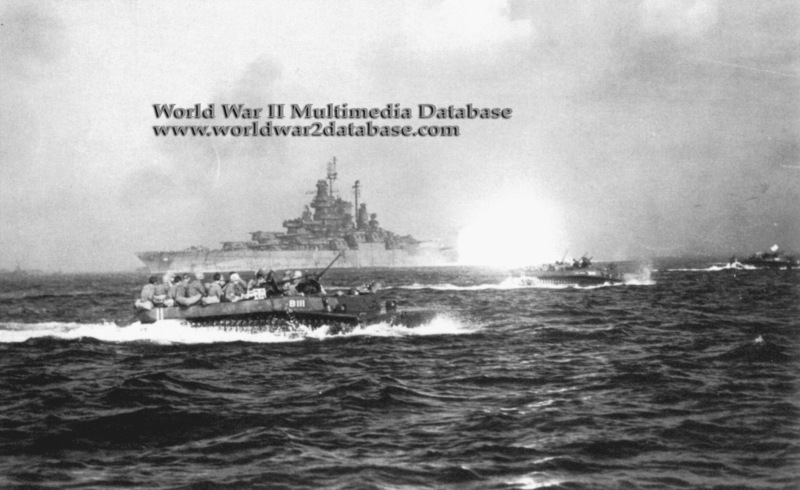 By nightfall another 10,000 troops had come ashore and a 15,000-yard beachhead had been established with 6th Marine Division on the left, then 1st Marine Division, then 7th Infantry Division and 96th Infantry Division on the right.